West Valley, Ariz. – Benevilla is excited to announce that the event “Coffee with a Cop” was a big success. 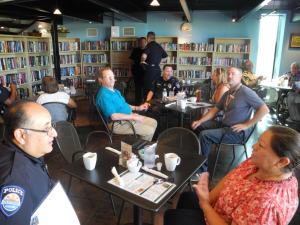 On Thursday morning, July 12th about a dozen officers from the Surprise Police Department and lots of community members came together in an informal and stress-free environment to discuss community issues, build relationships, and drink coffee. All community members were invited to attend. The event was held at Birt’s Bistro on the Benevilla main campus located at 16752 N. Greasewood Street. This event provided a unique opportunity for Surprise citizens to ask questions and learn more about the department’s work in the city’s neighborhoods. “We want to thank the City of Surprise Police Department for hosting their community event at Birt’s Bistro at Benevilla. It was heartwarming to see so many community members and local business owners spending quality time with our first responders to learn about what they do in the community and how they can build better relationships together” said Benevilla Marketing Director, Taylor Bergholz. The “Coffee with A Cop” program was launched in Hawthorne, California in 2011. Members of the Hawthorne Police Department were looking for ways to interact more with the citizens they served each day. Community policing had long been considered a framework for establishing trust between the community and the police. However, over time the character and composition of our nation’s communities have changed due to shifting demographics, more commuters and the introduction of different communication methods including social media. The Hawthorne Police Department hit upon this simple plan to break through the barriers that have been built over the years – a cup of coffee. In less than five years, “Coffee with a Cop” events have been hosted in all 50 states and are one of the most successful community-oriented policing programs across the country. Started by and for our community in 1981, Benevilla enriches lives of west valley residents by serving older adults, adults with disabilities, children and the families who care for them. For more information on services, volunteer opportunities, to schedule a tour or donate to Benevilla, call 623-584-4999 or visit www.benevilla.org.